Ruby is a red gemstone that has variations between pink to blood red and is one type of corundum mineral (Al2O3). Ruby types include very hard stones that have a value of 9 from Scale 10 Mohs. Red in Ruby is mainly caused by chromium (aluminum oxide) with a Hexagonal installation system. 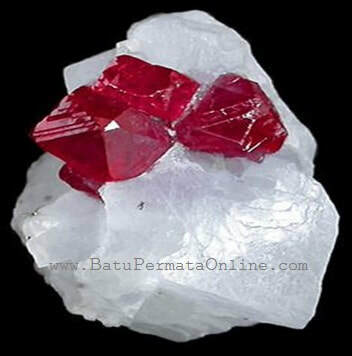 The best Ruby is blood red (Blood) and Crystals originating from Burma (Myanmar). Whereas African Ruby is rather dark red and not crystal. Ruby symbolizes courage, strength and luck for the wearer. the most valuable and valuable ruby ​​of all colored gemstones. Rubi has had something important in many cultures for thousands of years. Ruby is characterized by dynamic shades that are red, red is very good (aspects reflect light almost like a mirror), and hardness (difficult to start and therefore tough). Very large quality ruby ​​gemstones are very rarely found. Clarity: Natural rubies Most have some cloud conditions or imperfections. very few really clear. Better quality rubies are transparent, and not opaque. Color variations: Red-blood, purplish, and brownish. Transparency levels: Transparent, translucent, opaque. Refractive index: 1,766 - 1,774. Hardness: 9. Specific Weight: 3.97 - 4.00. Ruby producing regions: Burma / Myanmar, Sri Lanka, Thailand / Thailand, Tanzania. Stone aura: Radiating authority, fostering confidence and policy in making decisions.